Sound (7.8/10) – Brainwavz has produced a lot of great earphones over the years, from the original M1 model, which remains one of my top recommendations in its class, to the reference-grade (yet very inexpensive) B2. The unifying factor is good performance for the price, and that’s the case with the S1 as well. The S1 is a bass-heavy earphone with a v-shaped sound signature. The bass is powerful and extended, with a good balance of mid-bass impact and sub-bass depth. The low end is not the most controlled, but it is less muddy compared to most other in-ears that are similarly well-endowed when it comes to bass. Despite its v-shaped balance, the midrange of the S1 doesn’t sound heavily recessed, partly due to the fullness of the sound and partly because of the prominent upper mids. Strong upper midrange presence also helps with the clarity, reducing the effect of the powerful low end occasionally intruding on the lower mids. Ultimately, this gives the S1 good vocal intelligibility and better clarity compared to other sets with similar bass quantity such as the NarMoo S1 and Tekfusion Twinwoofers. The strong top end of the Brainwavz does come with some caveats – the earphone sounds a little peaky and has a tendency towards harshness and sibilance. Far from a deal breaker – in fact, the sibilance is in good company with the likes of the popular – and much more expensive – VSonic GR07 in the way it is presented. Also, while the S1 has plenty of treble energy, its tone is not particularly bright thanks to the heavy bass. Similarly, the energetic top end is a tolerable – even beneficial – as a way of counterbalancing the bass, especially at low-to-medium volumes. On the point of volume, the S1 has above-average sensitivity despite the rather low stated figure. Its overall tonality is hard to characterize – the energetic treble prevents the earphones from sounding particularly warm, but they also don’t sound bright because of the strong bass. To provide some comparisons, the MOE-SS01, a similarly-priced dual-dynamic earphone, sounds colder (and harsher) next to the Brainwavz S1 thanks to its flatter, even more upper midrange-heavy sound. The T-Peos Rich200, on the other hand, is downright brighter – its signature is v-shaped, but biased less towards the low end than that of the S1. The SS01 is more spacious than the S1, whereas the Rich200 has a smaller, more in-the-head presentation. 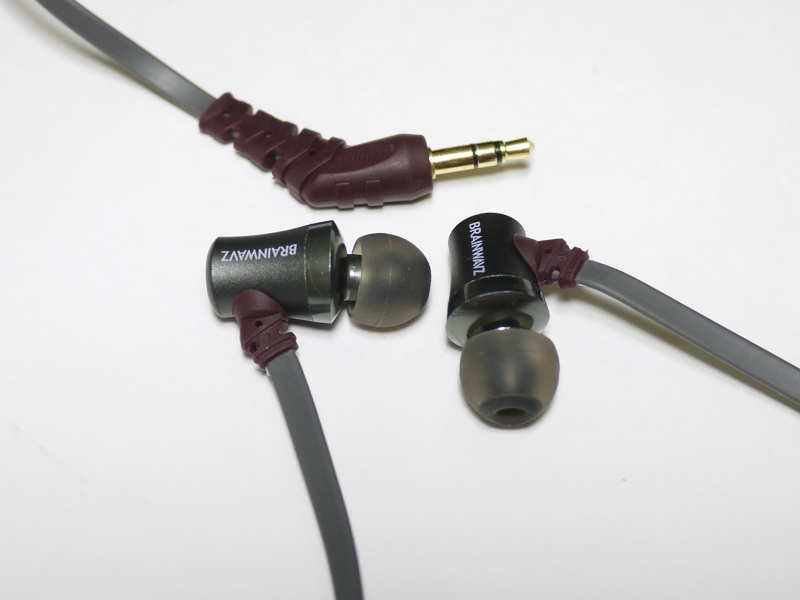 The identically-titled NarMoo model is, like the Brainwavz S1, a bass-heavy earphone. What’s surprising is just how similar these earphones sound – through the bass and lower midrange, the S1 matches the S1 almost note for note. The NarMoo unit is a hair bassier and bleeds more up into the midrange as a result, but the difference is small. The NarMoo S1 sounds warmer overall and has a thicker sound. The Brainwavz S1 has a thinner midrange with a brighter tonal tilt. It sounds clearer and has more treble sparkle than the NarMoo S1. However, its treble tends to be more sharp and sibilant, especially at higher volumes, compared to the more laid-back highs of the NarMoo. The VSD1S follows the sound signature of VSonic’s higher-end models, delivering a mildly v-shaped sound with punchy bass. Brainwavz’ similarly-priced S1 model is more powerful at the low end, offering up more of both impact and depth. The bass of the S1 tends to be a little more intrusive. However, despite its tighter, less powerful bass, the VSD1S still sounds a little more distant and veiled in the midrange. The S1 has more presence in the upper midrange and lower treble, which makes its mids sound more clear, crisp, and intelligible. The VSD1S has less upper midrange emphasis than the S1, sounding smoother overall up until the mid-upper treble, where a couple of narrow peaks make the VSD1S somewhat sibilant. The S1 is similarly unforgiving of sibilants and offers up even more treble energy overall. From a tonal standpoint, the VSD1S is more neutral and accurate. Worth noting is that the bassier, livelier S1 is more sensitive than the VSD1 and will definitely have more of a “wow” factor for casual listeners than the flatter VSonic unit. The R3 is a dual-dynamic monitor with a balanced and refined sound, serving a very different purpose than the S1. The S1 provides an upgrade to popular mainstream sets such as the Klipsch S4 and Beats by Dre Tour while the R3 channels the signatures of higher-end earphones such as the $500 Shure SE535 and $250 Sony MDR-7550. It is flatter and more neutral than the S1, with tighter bass and more refinement all around. The S1 has heavier bass, but also sounds more bloated and a little dark in tone. The treble of the S1 is peaky in comparison, making it sound harsher and more metallic next to the smooth and natural R3. However, the clarity of the S1 is on-par with the pricier R3, likely due to the stronger treble. Indeed, the R3 can sound a little dull and smoothed-over up top at times. The S1 is also a touch more coherent, while the pricier R3 has a wider, more spaced-out presentation. Value (8/10) – The Brainwavz S1 combines plentiful bass and strong treble to deliver a lively, engaging sound with a popular v-shaped sound signature. Its tuning is like an improved version of the best-selling Klipsch S4, for not much more money. Sure, it could stand to be smoother and the bass can get intrusive at times, but with a price tag well south of $100, good build quality, and a housing design that’s surprisingly comfortable when worn cable-down, the S1 is a good buy. thank u so so much for ur reply..
and last question xiaomi hybrid will be better or piston 3 or MOE SS01, in terms of SQ, I M from india and MOE is costlier by around 17 dollars than hybrid here.. The SS01 will have a wider soundstage if that’s your primary goal. Probably worth the extra $17 as long as you get a warranty as well. U R like gods messenger :), for budding audiophiles like me.. very helping indeed..
only yday i came to know of this site and i become fan of u, thanks for these reviews..
1)my que is should i go for piston 3, of xaomi hybrid or brainwavz s1? i hv mild preference for base but not much..
2) in ur review u gave piston 3, 8/10 on sound quality and brainwavz s1 7.8/10 does this mean that much cheaper piston is better than brainwvz s1 in terms of sound quality? The Piston 3 is the more accurate and more Hi-Fi earphone compared to the S1. The only reason I can think of to get the S1 over the Piston 3 is if you either 1) need heavy bass (the Piston 3 has good bass, but not too much of it), 2) prefer a more deeply v-shaped frequency response, or 3) prefer the design and build of the Brainwavz. In pretty much all other cases, the Piston 3 is preferable. And yes, there are many expensive earphones that just don’t sound very good. Is there any better earbuds at the same price range as Brainwavz S1 that I can buy from amazon uk? Thx man I really appreciate you answering our questions on here it really helps us choosing the right earbuds 🙂 and one more question do you think i should buy JVC HA-FXD80 Carbon Nanotube over brainwavz S1. I listen a lot of hiphop/rap and pop or is there some better ones on the range of 0-70? Betron YSM1000 and brainwavz S1. I’ve never heard of this brand. For hip-hop and pop I would probably go with the warmer and bassier S1 or Alfa Genus over the brighter FXD80. There’s a full comparison to the NarMoo S1 in the review above. That’s about as detailed as I can get, especially with regards to bass which is nearly identical between the two. If you only care about bass you might as well get the cheaper NarMoo unit.